Display at the Hot Science, Cool Talks event. Display in the SU Smith Library. 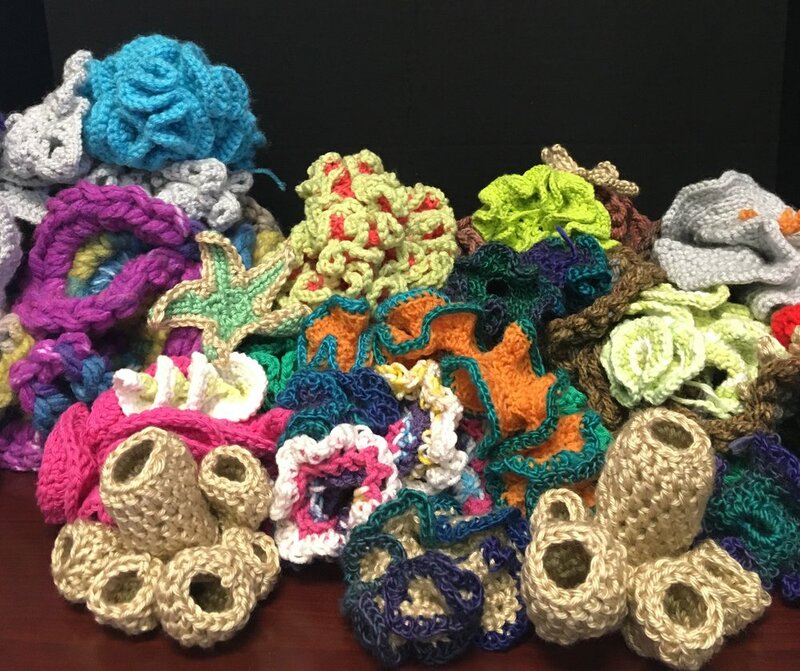 This project began when I was asked if I could display a crochet coral reef at the March 2018 Hot Science Cool Talks event at UT Austin, in conjunction with a lecture on Texas' coral reefs. I agreed, and gave two talks, one for the 107 Lecture in the Math/CS department, and one for the SU Art Association. Both times, I not only taught students about hyperbolic geometry and how crochet is able to represent hyperbolic space as well as the growth patterns of certain corals, but also how to crochet. In the end, eleven students, faculty and a faculty spouse contributed to the coral reef project, which was displayed not only at the Hot Science Cool Talks event but also in the SU Smith Library during the last half of Spring 2018. The contributors are listed below. Kari Darr ’20, Visiting Assistant Professor of Mathematics Linda DiLullo, Adina Friedman ’18, Associate Professor of Mathematics Fumiko Futamura, alumnus Christi Ho ’16, Abigail Jendrusch ’20, Jacob Jimerson ’20, Chris Nissen ’20, faculty spouse Elissa Schrum, Aiden Steinle ’20, Natalie Young ’20.